In November of 1966, The Monkees‘ first single, “Last Train to Clarksville”, went to number one on the charts two months (to the day) after The Monkees TV series premiered. The Partridge Family (a series about a fictional singing family/rock group) actually beat that mark. 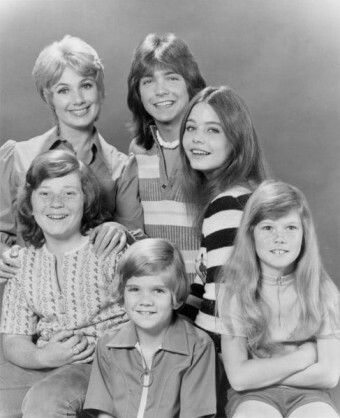 The Partridge Family premiered on ABC on September 25, 1970. The Partridge Family single, “I Think I Love You”, hit the number one spot on the charts four days shy of two months after the series premiere. The stars of The Partridge Family were Shirley Jones and David Cassidy. Although there were two other very talented performers on the show (Susan Dey and Danny Bonaduce), Jones and Cassidy were the only two members of the cast to appear on The Partridge Family records. Suzanne Crough and Jeremy Gelbwaks (later replaced by Brian Forster) were also featured in the show, but were fairly nominal characters. Shirley Jones had almost a perfect, storybook Hollywood career. She had starred in such classic Hollywood musicals as Carousel, Oklahoma and The Music Man. Although Jones was generally known as a typical movie “good girl”, she won an Academy Award for the movie Elmer Gantry in 1960, where she played a prostitute. And, of course, thanks to “I Think I Love You”, she also had a #1 record, so Jones is actually on a very short list of actors and actresses who have won an Oscar and had a #1 record. Shirley had already been cast as the mother of The Partridge Family before the rest of the cast were hired. But producers of The Partridge Family were wary and worried about casting Shirley’s step-son, David Cassidy, to play her son in the show. At this point in time, of course, no one knew much about David Cassidy or what he would bring to the show. According to Shirley, “They were very frightened about hiring David because they knew he was my step-son and they didn’t know how our relationship was. They didn’t know if we hated each other. So they came to me very sheepishly and said, ‘We tested David and really feel he’s best for the role. How do you feel about it? '” Shirley loved the idea. The truth was, in real life, David loved Shirley very much. He said he had originally “wanted to hate” her, but after his real-life mother’s divorce, he saw Shirley step in and he quickly grew to love her for her warmth and kindness. “We really based our love and friendship on an adult relationship, an offset to me being his (step) mother”, says Shirley. Despite early hesitations, it was soon realized that David would be the springboard and centerpiece for the entire series. After a few episodes, he became a teen idol to millions of swooning teenie-boppers all over America, and soon, the world. Cassidy skyrocketed into a multi-million dollar franchise the likes of which television had never seen before. David Cassidy records, photos, posters, t-shirts, notebooks, choker necklaces, et al, brought the network millions of dollars in merchandising. Cassidy, as far as millions of teenage girls were concerned, was the “Elvis Presley” of the early 1970s. The single “I Think I Love You” was featured in the first episode of the series. It hit the number one spot on the “Hot 100” chart on November 21, 1970 and remained at the top of the charts for three weeks. “I Think I Love You” is still a perennial favorite and remains a “bubble gum” pop-rock classic. The Partridge Family was a hit series that ran on ABC from 1970 to 1974. An infrequent visitor to the set was Shirley Jones’ actual son- and David Cassidy’s step-brother, Shaun. After seeing David’s huge success as a singer, he wanted to make a record himself. Shirley Jones strongly advised him against it- telling him to pursue an acting career before recording. But he was convinced he could duplicate David’s success- and he was right! A feat never to be done again! Trivia aside – Shirley Jones also portrayed the ‘brothel manager’ in an amusingly risque movie named “The Cheyenne Social Club” (with Henry Fonda and James Stewart). The movie was evidently released the same year as this tv series. Aren’t you overlooking Mae Axton and Hoyt Axton, who wrote the #1 singles “Heartbreak Hotel” and “Joy to the World”, respectively? The article never specifically states that only mother & son _performers_ are in consideration.